This Physical Sciences unit addresses the properties of light. It explores the phenomena of reflection, refraction, shadow and more. To research the concept of light and generate a list of statements that can be tested. To draw simple ray diagrams to show the paths of light from a source to the eyes. To explore opaque, translucent and transparent materials. To compare shadows from point and extended light sources. To use mirrors to investigate some of the properties of reflected light. To observe the refraction of light at the surfaces of different transparent materials. To investigate how the color of an object depends on the properties of the object. To investigate how the color of an object depends on the properties of the object and the color of the light source. This Science unit provides excellent opportunities for cross-curricular integration. Look for ways to meaningfully integrate the content of the unit with other learning areas e.g. Literacy and Numeracy. Prior to commencing the unit, develop a classroom display which focuses on light. Display posters, word wall vocabulary and learning goals that the students will engage with throughout the unit to stimulate their learning. For examples of additional teaching resources to display in your classroom, browse the Light and Sound collection on the Teach Starter website. The lessons and science experiments within this unit are structured in accordance with the scientific method. Ensure that the students are familiar with this process before commencing the unit. A comprehensive lesson plan addressing the concepts of fair testing in Science can be downloaded here. 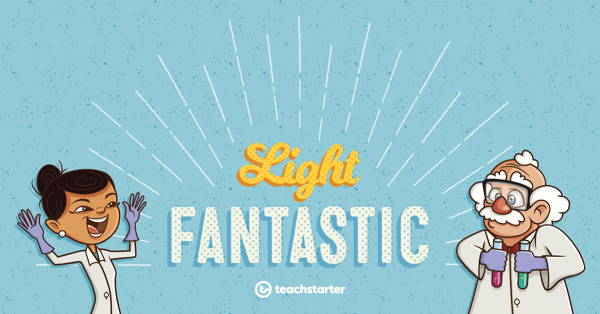 A 60 minute lesson where students will research the concept of light and generate a list of statements that can be tested. A 60 minute lesson in which students will draw simple ray diagrams to show the paths of light from a source to the eyes. A 60 minute lesson in which students will classify objects based on how much light is transmitted through them. A 60 minute lesson in which students will compare shadows from point and extended light sources. A 60 minute lesson in which students will use mirrors to investigate some of the properties of reflected light. A 60 minute lesson in which students will observe the refraction of light at the surfaces of different transparent materials. A 60 minute lesson in which students will investigate how the color of an object depends on the properties of the object. A 60 minute lesson in which students will investigate how the color of an object depends on the properties of the object and the color of the light source. An assessment task in which students will demonstrate an understanding of light and fair testing. Sixty light related vocabulary cards for a word wall. A 21 slide editable PowerPoint to use when teaching your students about light in Science. Science Experiment – Lights Line Up! A science experiment which explores light. A 20 slide PowerPoint to use when teaching your students about how to make a fair test in Science. A worksheet that explores classification of objects according to light transmission. A worksheet that explores the difference between shadows. A science experiment that explores reflected light. A set of 5 Task Cards with activities that allow students to observe the refraction of light. A worksheet that explores how we see color. A science experiment that explores the perception of color. A worksheet that explores light and shadow and the principles of a fair test.